I'm sure by now most of you recognize this ring as the ever-popular fingerprint ring from our longtime sponsor Brent&Jess.From the moment we introduced you to these unique rings back in 2009 (back when the company was called Fabuluster), y'all have been slurping them up and wearing them with love. 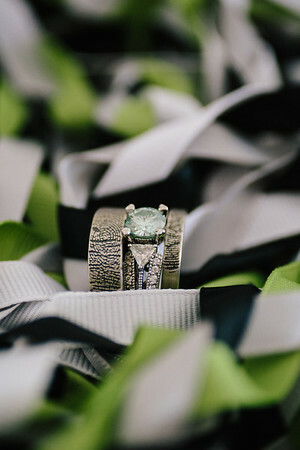 Brent&Jess is now back with a way to make these super personal wedding rings even MORE personalized. (I know, right!?) Let's take a look. For those of you who haven't seen fingerprint rings yet, here's the deal: Brent&Jess send you a kit to collect your finger impression, then you send it back and they create one-of-a-kind wedding rings imprinted with your fingerprints. Not only do you get one-of-a-kind rings, but you are involved in the process of creating your handmade ring from day one. Every Brent&Jess ring is handmade, one-at-a-time, by Brent and Jess on the Coast of Maine with eco-consciously sourced materials. So you can be absolutely sure that this fingerprint engagement ring will be the only one of its kind in the world. Pretty romantic, right? Now introducing Brent&Jess' signature rings! Much like the fingerprint, your signature is completely your own — no one else has it. Brent&Jess now have the new artistic capability to engrave you and your loved one's signatures into the surface of a ring. What do you get when you cross Brent&Jess' fingerprint with their signature rings? An heirloom to be treasured forever. Seriously: Brent&Jess rings will be one of the most special pieces of jewelry you will ever own. Now go look at all the cool wedding bands you can create with and for your partner! What beautiful rings! Someday I'll own one of these beauties! I wish they had these when I got married! I love handwriting so much. Wow, I really love this idea. I'm going to show it to my FH and see what he thinks, but I'm sure he'll love it! How incredibly timely! I just got an unexpected holiday bonus at work today, and my first thought was "Yay! Now Collin and I can start the process of having our amazing wedding rings made by Brent & Jess RIGHT AWAY!!" And then I see this post. 🙂 Going to the website right now… we have had our rings picked out for several years now, but maaaaaybe we will add in a little signature spice! I ordered a fingerprint ring for my husband. He loves it. I love it. Brent & Jess are very, very talented. I really really really really wish they had a signature/fingerprint locket! Boy oh man would I love that! We got our rings from Brent and Jess, too! The whole process was ridiculously fun, top to bottom. And the customer service was nothing short of stellar. And everyone just flips out over them once they realize that cool texture is actually our fingerprints! It helps soften the apparent blow that some felt from my lack of a diamond engagement ring, which seems to be akin to the murder of kittens in some circles. So what if I have an Edwardian emerald engagement ring and an uber-hip fingerprinted wedding band? Funky fresh, just like moi. Such a simple idea for personalising a wedding ring! Why do you only find out about this kind of stuff on blogs such as this. Keep up the good work! I am wearing my Brent & Jess fingerprint wedding ring right this very second, and my husband is wearing his. I'm not exaggerating when I say that the rings, as well as Brent & Jess's customer service, are PERFECT. I have just ordered mine and I have to say that they have been AWESOME! They are clear, kind, and get back with you quickly; I highly recommend them just based on their customer service. I am certain the rings will be perfect.